All views can have a caption that is either automatically generated or manually created. The caption is displayed on the Caption card. To show the caption, select it on the Show/Hide Cards toolbar menu or select Worksheet > Show Caption. The caption is automatically generated by default. However, you can edit the caption by double clicking the Caption card. In the Edit Caption dialog box, you can use change the font, size, color, and alignment and style. 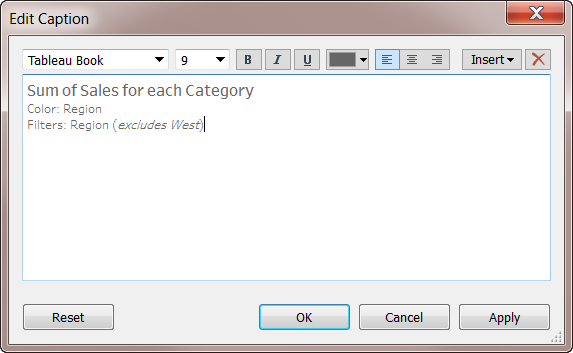 Use the Insert menu to add automatic text such as page number, sheet name, and field and parameter values. The caption can optionally be included when printing, printing to PDF, and publishing to Tableau Server. When you export the view as an image to another application like Microsoft PowerPoint, you can optionally include the caption.